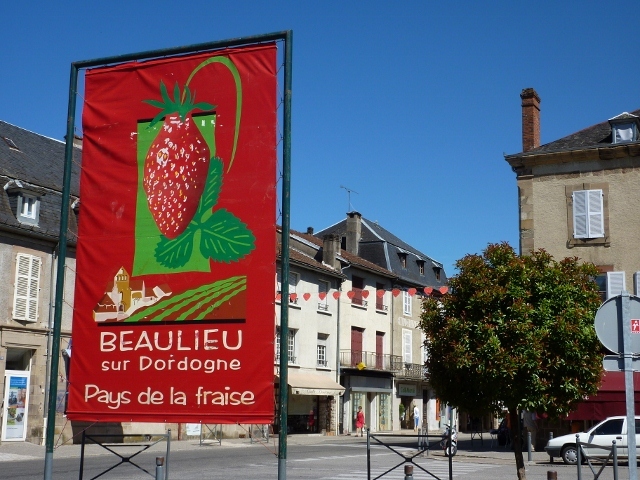 It seemed as though fate was tipping its hat to us when the Camping & Caravanning Club sent literature of their early summer rally at Montfort in the Dordogne region. Checking it out it appeared to be approximately midway along and on the bank of the river of the same name, The River Dordogne in south-west France. So the seed was planted and we booked onto the last week of the rally in late May 2011. 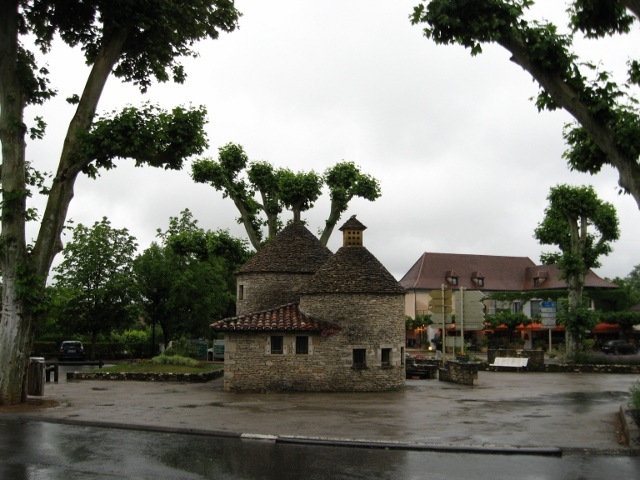 The idea being to attend the rally then head east and locate the source of the romantic Dordogne high in the Auvergne mountains and follow it along its westward flow to the mighty Gironde estuary and the Atlantic. So this first mini expedition in “Minty” our new/old van took us to our first club rally which was a huge success. We even played the adjoining Dutch rally in a Boules tournament. 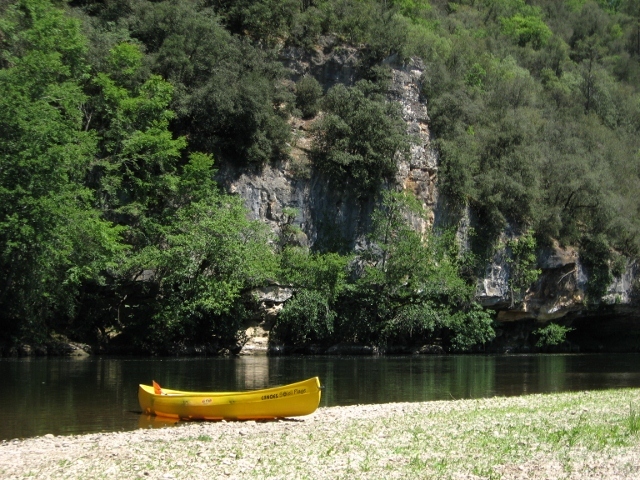 One lovely hot sunny morning we booked a canoe for a pleasant river trip. They drive you and the canoe upstream about twelve kilometers and you just peacefully drift and paddle back, with a stop at an inviting beach for a picnic, heaven. The nearby old town of Sarlat made for an easy cycle-ride, although a tourist honey-pot its worth a few hours visit to stroll the narrow cobbled streets and take in Foie Gras Avenue, Goose Square and the main square, La Place de la Liberte. Another local cycle-ride (or rather cycle-push ) was to the hill top Bastide village of Domme. 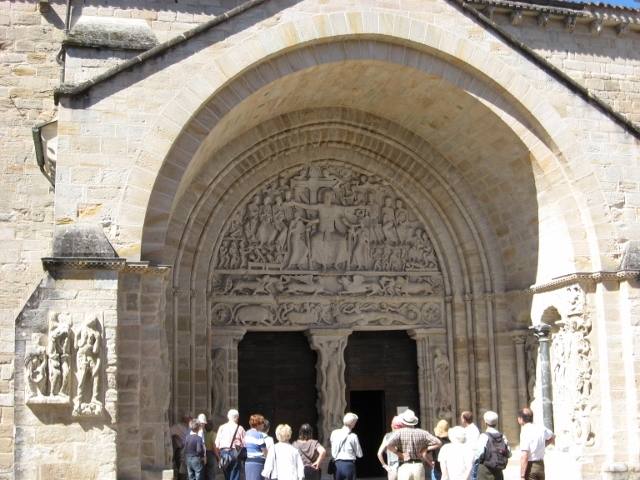 There were spectacular views down and across the Dordogne and around from the veranda style square. 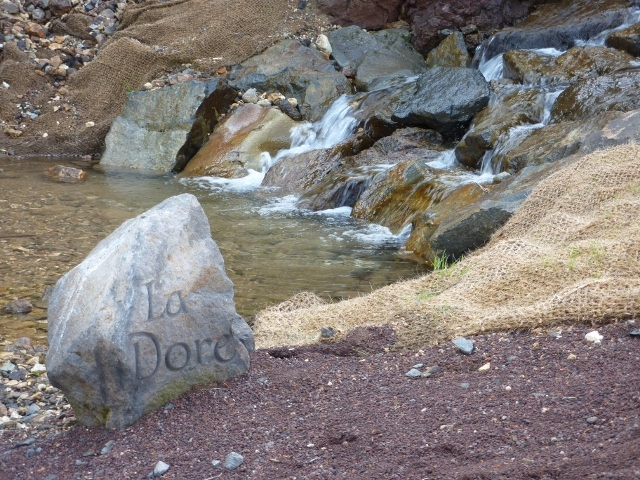 After our enjoyable week of rally life we drove eastward and a little nearer to our goal of The Source of The Dordogne. On the way we spent a few days at the wonderful medieval market town of Beaulieu-su-Dordogne, staying on the riverside island campsite there. Here we enjoyed some lovely local walks alongside the river and among the walnut tree orchards. The town was a little gem to explore with narrow cobbled streets and numerous small shops to tempt us. 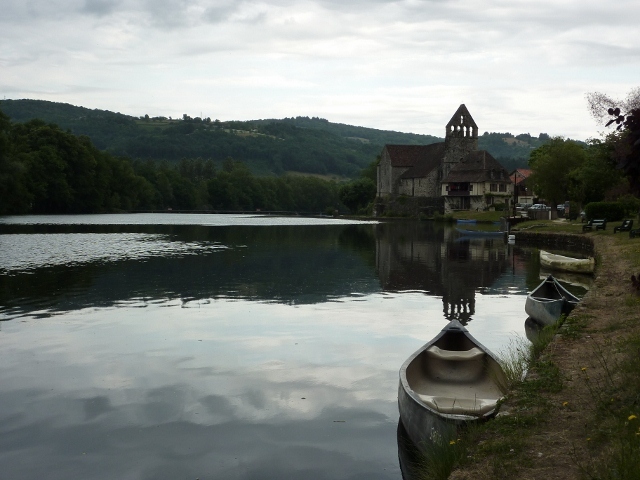 Moving on and keeping very close and mostly in sight of our now familiar river we stayed on another couple of quite peaceful sites before arriving at Mont-Dore in the Massif Central to tackle part of the ascent on the Puy de Sancy (1885 mts.). 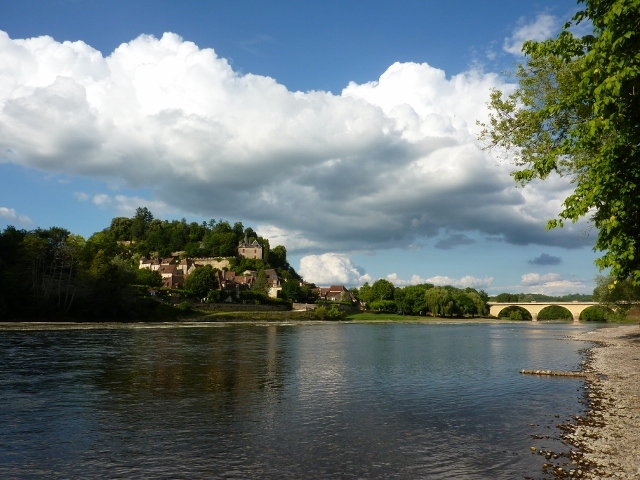 Where on its flank the young Dordogne is born. Well what an anticlimax this was , expecting to have to trek some distance to gain height to our goal. The carpark was within about half a kilometre of it. 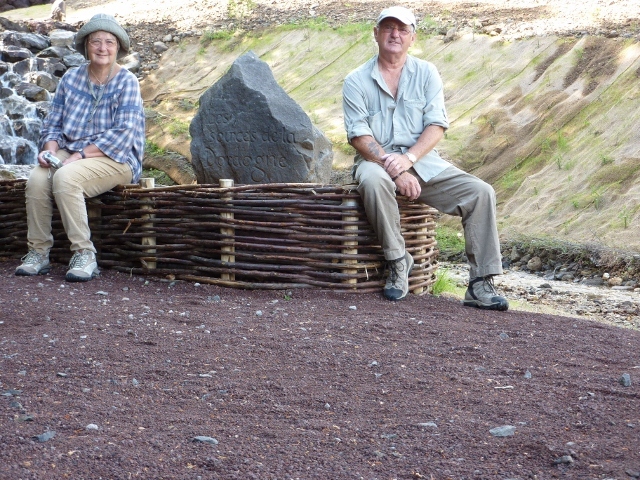 And the area around the source was a grassed, seating area, quite twee. Above a small waterfall are two small streams. 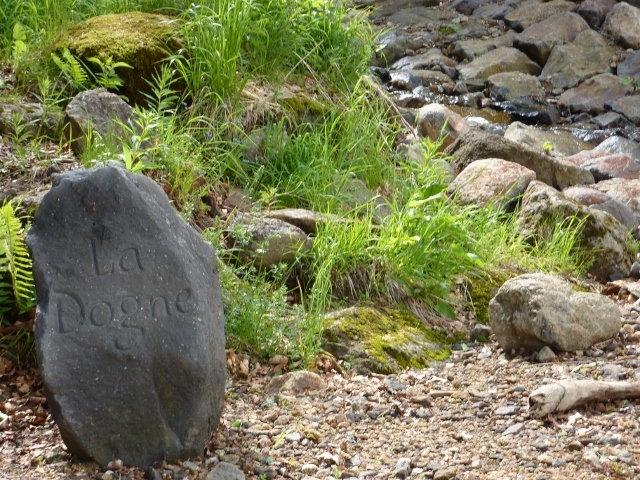 One called The Dore, the other The Dogne. Three guesses of the name of their coming together. This was to be the real start of our Source to Salt Water adventure. From its 1720 height here it flows 483 kilometres to enter the Gironde and finally the Atlantic Ocean. Very soon our infant stream became a young river. Keeping it almost alongside us as we travelled along the Dordogne valley it wasn’t long maturing into a grown-up river. 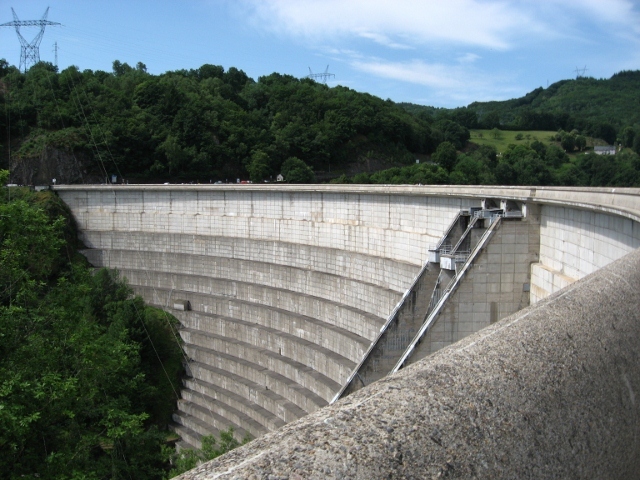 On reaching the impressive Barrage at Bort-les-Orgues it fans out to become a huge reservoir. 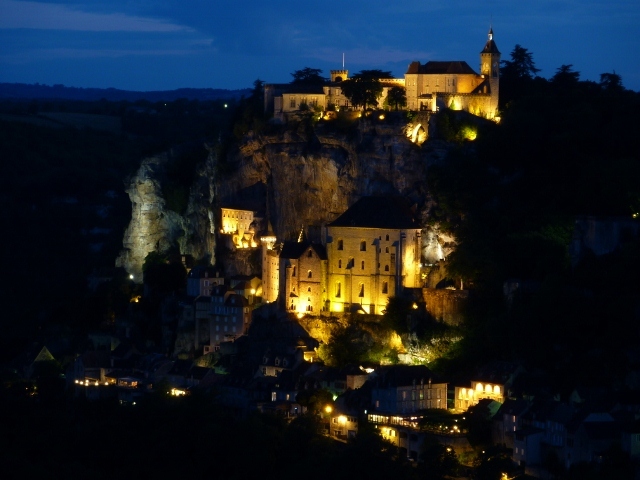 After another few nights at our favourite site at Beaulieu-s-D on our return we drove into the next valley to visit the pilgrims Mecca of Rocamadour. What a place. A whole 11th. century village built below, onto, against and into a shear rock cliff face. There are dozens of various craft and gift shops seven churches and chapels all on levels reached by numerous steps and stairways. One such stairway, L’Escalier des Pelerrins (Pilgrims’ Staircase) was climbed by past penitents on their hands and knees. Still travelling west we found another gem of a campsite at Limeuil. 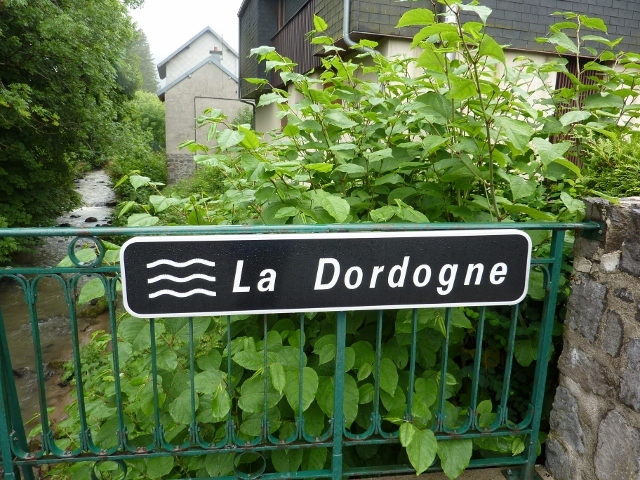 Right on the bank of our friend, the river Dordogne, it was ideal for some lovely walks and cycling. Above the opposite bank was the medieval hilltop village itself. 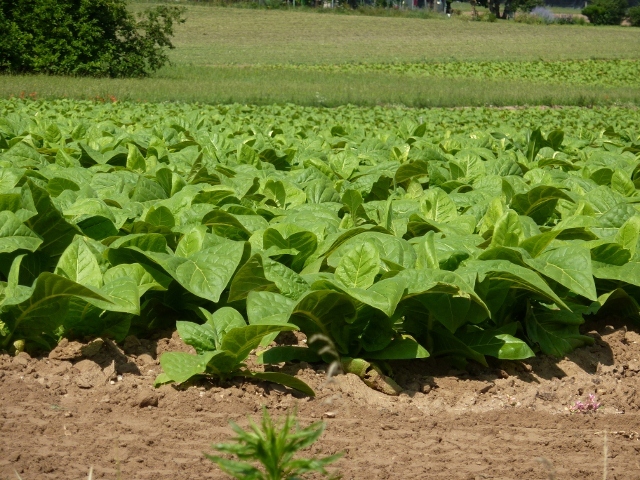 On one local river-side ride we found what we had read about and had been looking out for, fields of Tabacco plants for the nearby capital of the French Tabacco industry at Bergarac. 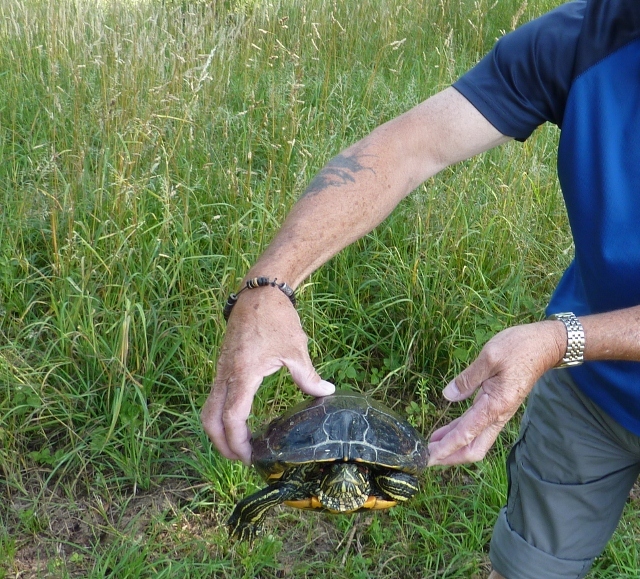 We also came across a huge wayward terrapin on the side of the road, which we moved to a safer spot. 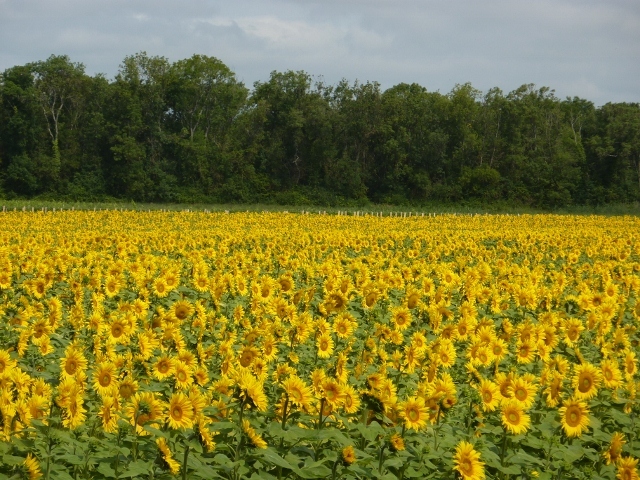 It was in this area there were seemingly endless fields of golden Sunflowers. 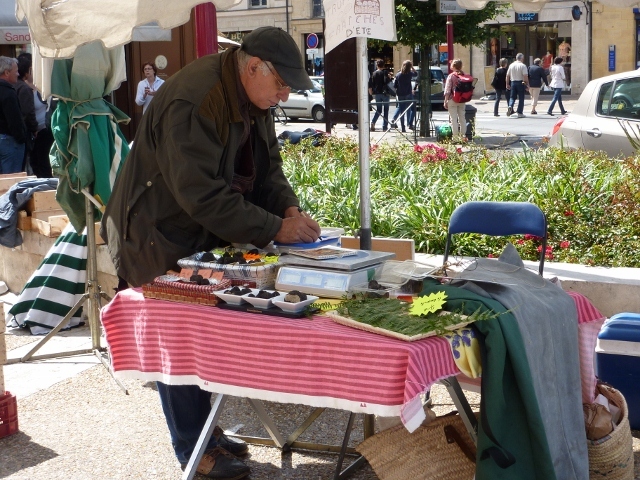 Our next port of call was Bergerac with its busy and colourful Saturday market. We even found a little stall where a typically attired Frenchman was selling the famed Truffles. The Mussee of Bergerac Wine was well worth a visit with an English speaking film on the production of their famous wines. After a peaceful night here the time had come to travel to the ancient 17th. 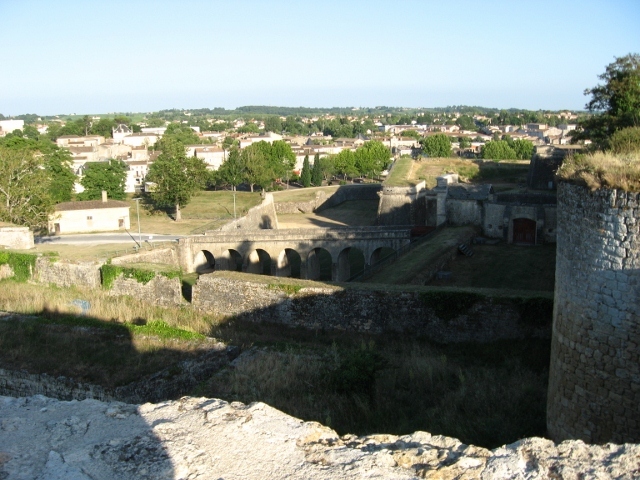 century Citadel of Blaye. 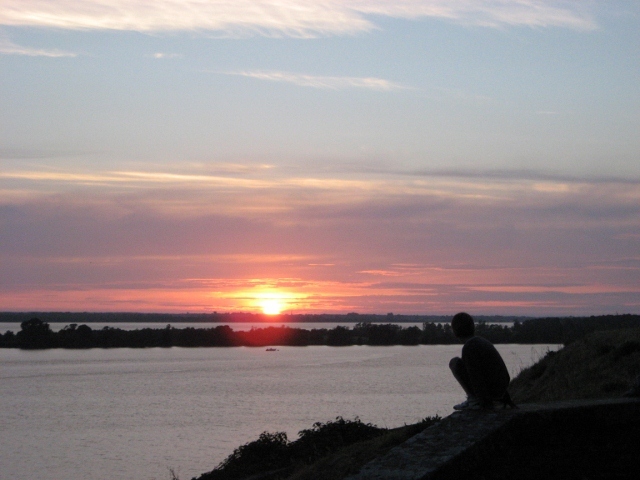 Here we would be able to complete our goal and witness the River Dordogne come of age and flow into the salt waters of the mighty Gironde estuary and shortly the ocean. Camping in the old walled Citadel was a real treat with its narrow cobbled streets being haveing been accessed by driveing over the wooden drawbridges and through archways with the minimal of clearance. Whilst there we were entertained by the Fete-de-la-Musique being played out over the weekend. Seemed a fitting tribute to our mini adventure. Once again an ever winding river had acted as a natural guide through a wonderful area of France. 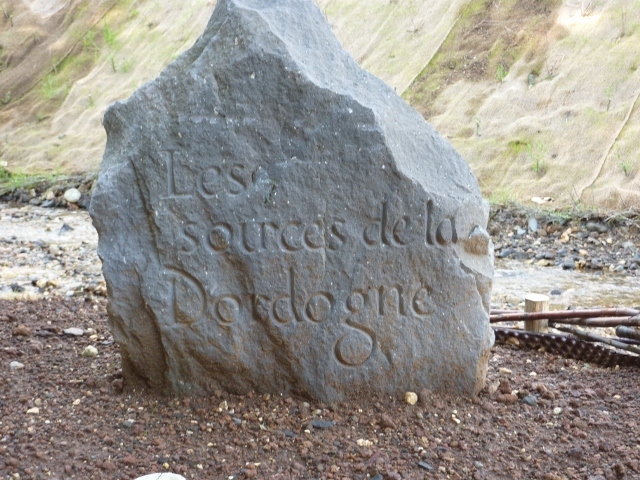 One Response to Dordogne, Source to Salt Water. Nice to see you back on line.I love the new layout.